When talking about iTunes multimedia, DRM protection is always a topic you can't neglect because most contents in iTunes come with DRM protection. On September 12, 2017, Apple released iTunes 12.7 update which focused on music, movies, TV shows, podcasts and audiobooks. Among the contents, Apple Music, movies, TV shows, music videos and audiobooks are DRM protected. If you want to find iTunes DRM removal software to enjoy them freely, iTunes Converter Toolkit which includes Apple Music Converter and M4V Converter Plus is the bundle you shouldn't miss. Part 1: What Contents in iTunes are DRM Protected and Why iTunes DRM Removal Software is Necessary? Part 2: Which is the Best Apple Music DRM Removal Software? Part 3: Which is the Best iTunes M4V DRM Removal Software? 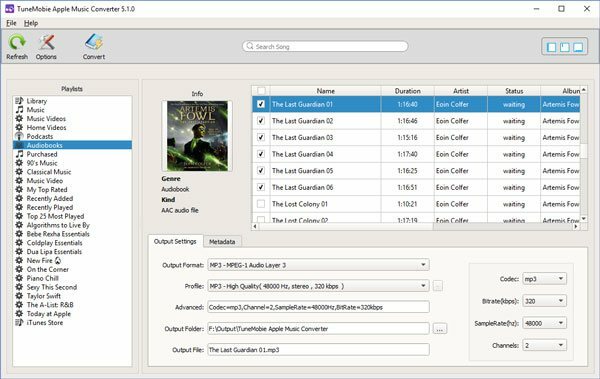 Part 4: Which is the Best Audiobook DRM Removal Software? From iTunes 12.7, iTunes only focused on music, movies, TV shows, podcasts and audiobooks, revamped built-in App Store and ringtone management. And in an earlier time, iTunes removed iBooks management and make iBooks a standalone application. The remained contents are either audio or video files, but not all of them are DRM protected. We will introduce the contents below and tell you what types of contents are DRM protected and how the DRM protection restricts people to enjoy on authorized devices only. You can purchase a song or an album here. Purchased and downloaded songs are M4A format which is also called unprotected AAC. You can play them on all kinds of devices and use in various video editing software and DVD authoring software without limitation. Apple Music is a streaming music service, you can pay subscription fee to enjoy over 45 million songs on authorized devices including Windows 7/Mac 10.9.5 or above, iOS 8.4 or above, Apple TV 4 and Android mobile with Android OS 4.3 or above. Downloaded Apple Music songs are in M4P format and can't be synced or copied to iPod Nano, iPod Shuffle, PSP, Sony Walkman or MP3 players. If you want to enjoy Apple Music freely, you need to remove DRM protection first. The movies and TV shows you purchased and downloaded from iTunes Store are in M4V format and come with DRM protection. The M4V videos are associated with your Apple ID and can be only viewed on iPod Touch, iPhone, iPad, Windows and Mac with your Apple ID authorized. The M4V videos can't be played on any Android mobile phones or tablets, PSP, PS4, Xbox, Kindle Fire or other non-Apple devices. There are some free TV shows but they are still DRM protected and can't be viewed on non-Apple devices either. If you have subcribed Apple Music, you can download and enjoy some music videos for free. The music videos are also DRM protected M4V videos, just like the movies and TV shows and can't be viewed on non-Apple devices. If you want to enjoy iTunes movies, TV shows and music videos on Android mobile phones and tablets or other non-Apple devices, you also need to remove DRM and convert to all-purpose MP4. Podcasts could be either M4A audio or MOV/MP4/M4V video files. Podcasts are not protected and you can transfer to any other device as long as the media formats are supported on them. You can subscribe podcast to learn some lessons or get some information. iTunes audiobooks are in M4B format and come with DRM protection as well. Similar to Apple Music's M4P format, it can be only listened on authorized devices as well. If you want to enjoy audiobooks on any devices freely, you also need to remove DRM protection first. iTunes can be also used to manage your AA/AAX audiobooks purchased from Audible.com, but you need to log in your Audible account in iTunes. AA/AAX audiobooks can be played on more devices than iTunes M4B audiobooks, but still the DRM protection is the barrier to enjoy on any devices. To enjoy Apple Music on any devices, Apple Music DRM removal sofware is necessary. Some audio recording software programs claim that they can remove Apple Music, but you need to play Apple Music songs in iTunes, manually start and stop recording for each song and edit the ID3 tags of recorded audio files. So such audio recording software can't be counted as Apple Music DRM removal software. There are some Apple Music DRM removal software like TuneMobie Apple Music Converter, Sidify Apple Music Converter and Tuneskit Apple Music Converter which can directly remove DRM protection from Apple Music and convert to MP3 or M4A with ID3 tags kept. 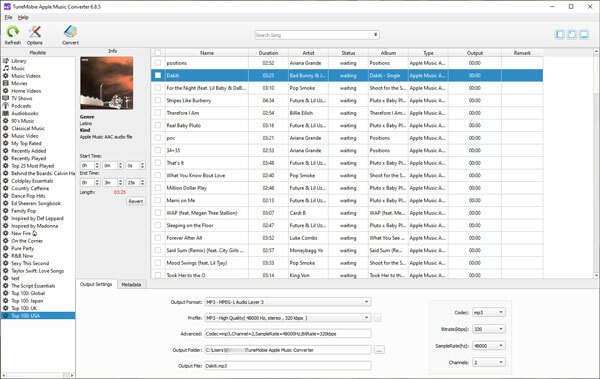 In another article, we have compared the 3 Apple Music Converters from supported input formats, supported output formats, features of preserving and using ID3 tags, conversion speed and pricing options. And we have got the conclusion that TuneMobie Apple Music Converter is the best Apple Music DRM removal program. Click the link below to check the side-by-side comparison. TuneMobie Apple Music Converter is available for Windows and Mac, and fully compatible with latest Windows 10 and macOS Mojave. Get the free trial to have a try and you will know why it's best for Apple Music DRM removal. To use TuneMobie Apple Music Converter to convert Apple Music songs to MP3 or M4A, you can simply launch this program, and iTunes will be automatically launched and iTunes library will loaded and listed in the left panel, choose the Apple Music songs or playlists, choose MP3 or M4A as output format and click Convert button. It's that easy! Removing DRM protection from iTunes M4V videos is much more complicated. Most iTunes M4V DRM removal software play M4V video and record it in the meanwhile. And audio tracks and subtitles will be lose in the output MP4 video. As iTunes and DRM technology update, some iTunes M4V DRM removal can't work any more. In another article, we have listed top 5 iTunes M4V converter for your reference. And TuneMobie M4V Converter Plus is the only one which can directly remove DRM protection and losslessly convert iTunes M4V to MP4 with all audio tracks and subtitles retained. TuneMobie M4V Converter Plus can work on Windows 7/8/8.1/10 and Mac 10.9.5 - 10.12.6. Get the free trial to have a try and you will know why it's best for iTunes video DRM removal. 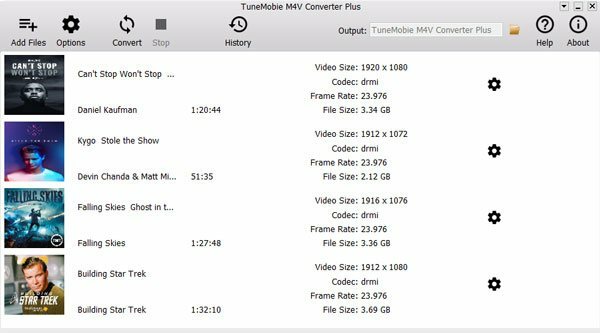 To extract audio from DRM protected M4V videos, you can extract audio from MP4 files converted from M4V videos with TuneMobie M4V Converter Plus, or use TuneMobie Apple Music Converter we mentioned above. TuneMobie Apple Music Converter we mentioned above is not only for Apple Music DRM removal, but also for audiobook DRM removal. It can remove DRM protection from both iTunes M4B audiobooks and Audible AA/AAX audiobooks to MP3 or M4A. When converting audiobook to M4A, all the chapters can be kept in the output M4A. This program can also convert unprotected M4B audiobooks you added to iTunes library. With TuneMobie Apple Music Converter, you can convert Apple Music, audiobooks and other iTunes compatible audio files, extract audio from iTunes M4V videos and home videos you added to iTunes library. It's an all-in-one iTunes audio DRM removal software. Removing DRM protection from audiobooks and converting them to MP3/M4A is similar to removing DRM from Apple Music. Just Click Audiobooks playlist and select the audiobooks, other steps are same. According the introduction above, we know that Apple Music Converter and M4V Converter Plus are enough to remove DRM protection from all iTunes multimedia contents. If you have subscribed Apple Music and purchased audiobooks, as well as purchased iTunes movies and TV shows, you don't need to buy Apple Music Converter and M4V Converter Plus respetively. Because iTunes Converter Toolkit, which is a bundle composed of Apple Music Converter and M4V Converter Plus can be a money-saving bundle. With iTunes Converter Toolkit, the ultimate iTunes DRM removal solution, you can enjoy Apple Music, iTunes movies, TV shows, music videos and audiobooks on all kinds of devices without any limitation.